South Pacific superyacht support provider, Marinelogix, has been recognised for its effective and culturally-cognisant approach to yachting in the South Pacific. The company has received two nominations for business excellence in New Zealand’s National Pacific Business Trust Awards. “Marinelogix is our vision of a Pacific-based company that represents and profiles the region, its people, and its culture on a global stage to yacht owners, captains and crew,” says Mark Donaldson. The company is an independent entity which operates without affiliation to agency networks in the Pacific, allowing it to deliver first class, personalised and customer-focused service. The National Pacific Business Trust Awards is an initiative which celebrates success, growth and sustainability of people of Pacific Island descent in business. Marinelogix has reached the finalist stage in both the Pacific Business Exporter Award, and Pacific Business Entrepreneur Award. Co-founder Donaldson, who has received a nod for the entrepreneur award, attributes the success of the company to combining global experience, with his Polynesian culture which has humility, hard work and personal connection as driving forces. The company is unique in the Pacific region among superyacht service providers in that it is Pacific-owned and operated, and has had great success with its clients largely pulled from Europe and the US. Donaldson draws on his Samoan heritage and Cook Island upbringing to inform the business, combined with his extensive global superyacht industry experience. 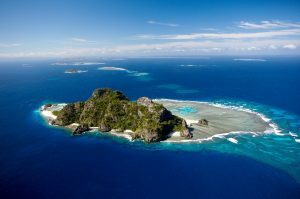 Aerial views, Monoriki island, Mamanuca islands. Fiji Islands. His career has spanned over 20 years in the marine industry, including as director of yacht management for superyacht powerhouse, Y.CO, director of operations for a private fleet based in the Gulf region and Oneworld Challenge America’s Cup team logistics manager. That entrepreneurial spirit saw Donaldson and his team create a logistics service, MLXpress, alongside the superyacht support arm to quickly deliver marine consignments from around the world to the furtherest reaches of the Pacific. The initiative has now been put to use moving supplies quickly into the Pacific for cyclone relief when required. The National Pacific Business Trust Awards will be announced on 28 October, in Auckland, and will highlight the leading lights in Pacific businesses.